Botanical name : Myrthus Communis L.
Organic Myrtle essential oil is valued as an astringent, antiseptic skin care agent that cleanses, tightens pores, assists oily skin, and fights infection. It displays significant antimicrobial activity. An effect on the central nervous system by means of an increase in the duration of sleep was also proved. According to a study at Brigham Young University, Myrtle essential oil was 95% effective at inhibiting the growth of breast cancer cells (Stevens, 2005). 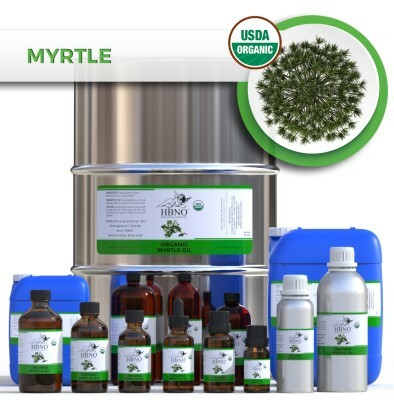 HBNO is pleased to offer usda organic myrtle essential oil in small packing to bulk and wholesale quantities. We can supply any amount of oil to anywhere in the world.